Harrogate Town striker Dominic Knowles is hopeful of returning to training this week, but fears it may be a while before he kicks a ball in anger. 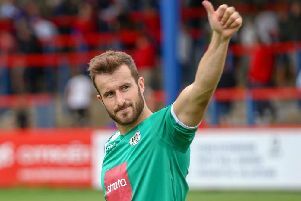 The 27-year-old has been sidelined for almost a month having picked up an injury less than 24 hours before the club’s 1-0 victory at Chesterfield on February 23. “I’m hoping to be back running this week, but we’ll have to wait and see,” Knowles said. “The swelling and bruising around my ankle has gone now, however it still feels a bit stiff. It’s difficult to do too much without thinking I’m going to tear the ligament again. Knowles is suffering from syndesmosis ankle ligament damage, an injury he picked up during training. The syndesmosis is the name of the ligament that connects two bones of the leg, the tibia and the fibula, and is located between the knee and ankle joints. “It was a bit of a freak incident,” Knowles explained. “I was kicking the ball and put all my weight on my left foot. When it went it felt very painful. “I’ve had a few injuries and it’s obviously very frustrating, but there’s nothing you can really do about it as a player. 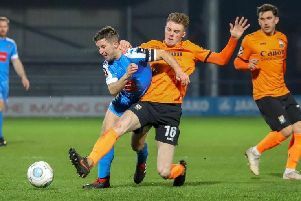 Knowles last featured for Town as an 81st-minute substitute during January 19’s 3-1 home win over Hartlepool United, and conceded that there is a possibility that he may not play again this season. “The plan is to get back to fitness as soon as possible, but even when I’m ready to play again, I think it will be tough to get back in the team,” he continued. “The lads are doing really well at the moment and I don’t see any reason to change anything. “Credit to the lads for how well they’re playing. No player is guaranteed to be selected and I’m not gonna sit here and say that I should be back in the team when they’re performing like this. “Obviously I’m hoping to get back in the squad as soon as possible and you never know what can happen in football. Someone may pick up an injury and I might be needed.